Krinkle bag series - surplus-neus Webseite! The extraordinary feel and look of our Krinkle bag series immediately attracts its viewer’s attention. 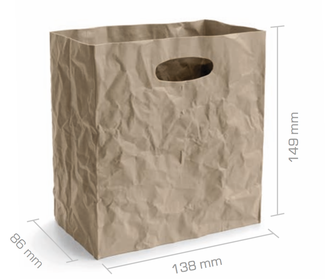 What looks like a paper bag is actually a precious synthetic box, which surprises with its various using possibilities (e.g. flower vase, magazine holder, paper-bin, toy-box, lamp, office container and much more). 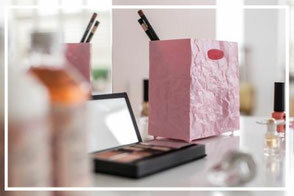 The Krinkle bags are a hip accessory for every home and office. Due to the choice of three different sizes (small, me­dium, large) and selected standard and trend colors, there is no limit for the user’s creativity. 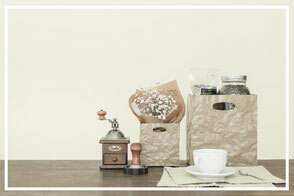 The Krinkle bags are available as single boxes and sets. Thanks to the high-quality material, they are very easy and hygie­nically to clean. The smallest version of the Krinkle bags convinces with its handy dimensions and versatile application options. It is especially suitable to store small items. In the kitchen, as a cutlery box, at the desk for office material or as a storage box for hygiene articles in the bathroom. Also as a flower vase it turns out to be a real eye-catcher in every room. 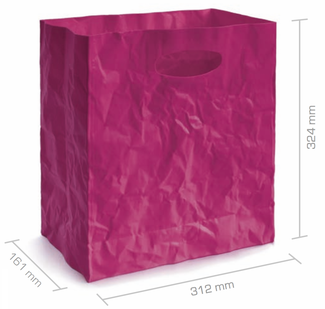 The medium size of our Krinkle bag series is the Krinkle Bag medium. Anything that is is too big for the small box fits here! It is the perfect item to be used as a magazine stand, plant pot or storage box for children’s toys. Also, illuminated (e.g. by an LED light), this pretty box lights up every home. Are you looking for a creative and sustainable gift packag­ing? Here we have the solution! The medium bag is ideal for giveaway’s or gift packages containing wine or gourmet articles. With the largest version of the Krinkle bag series, the Krinkle Bag large, an on first sight common commodity item turns out to be a box with a WOW - effect. 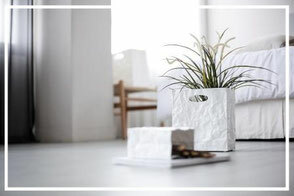 The assumed paper-shopping bag does not only stow away your everyday items, it is also a fash­ionable decorative element in your home. 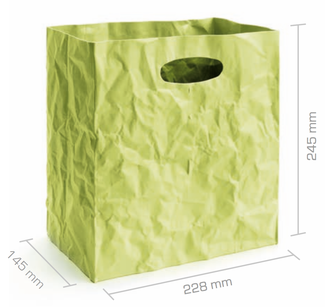 Addition­ally, it is also a practical helper as a stylish paper basket. The baking set, a perfect gift for every housewarming party and birthday! 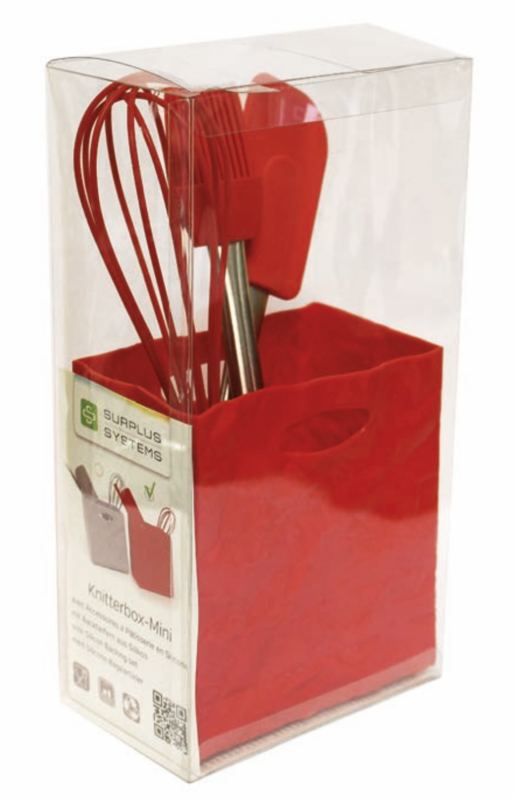 This unique kitchen utensil in trendy colors consists of a Krinkle Bag small, a brush, a spatula and a whisk. The high-quality and heat-resist­ant silicone and the solid and easy-to-clean Krinkle bag make our baking accessory set so special. 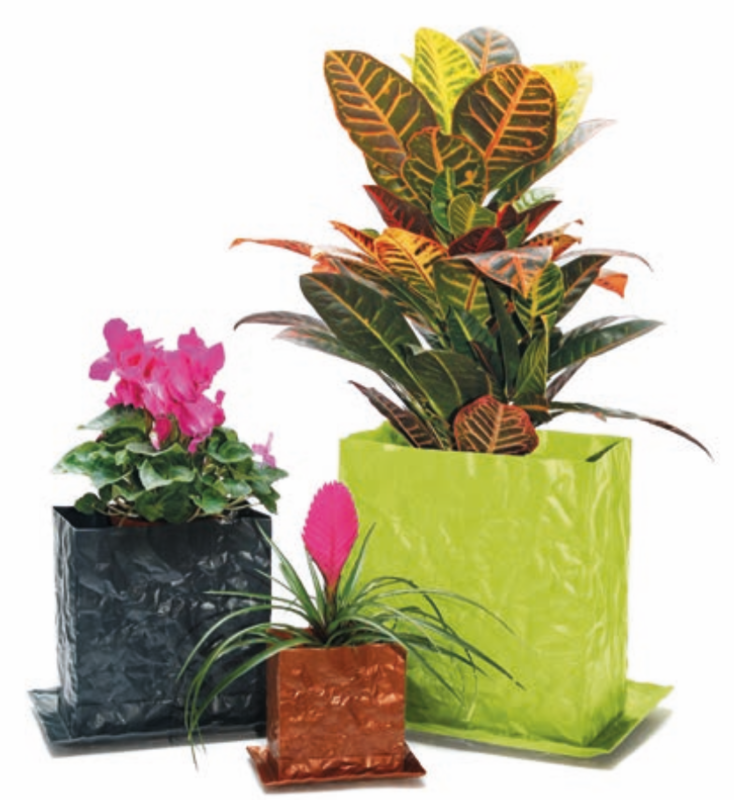 Our Krinkle plant pot series consists of three sizes: small, medium and large. The design and sizes are based on our Krinkle bag series. The Krinkle plant pots have a timeless elegant design and are available in nu­merous colors. They come with a saucer, which gives the plant pot an extra stability and catches excessed water. The bottom of the Krinkle plant pot is equipped with two holes, so that the water can drain easily. Due to the Krinkle design, the plant pots - with a three-dimensional surface - are particularly suitable as decorative planters. The series is made of environmentally friendly and UV-resistant plastic. 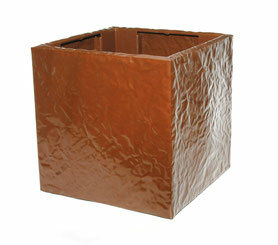 The Krinkle planter is a large plant pot with a cubic shape in the Krinkle design. It consists of a robust structure made of high-quality plastic that is suitable for in- and outdoor use. The Krinkle planter is very use­ful to hold bigger plants.